My boys had fun at the audition by Media Corp and J was selected for the chinese drama. Later on, we were also contacted and boys acted as calefes with Andie Chen and Rui En. 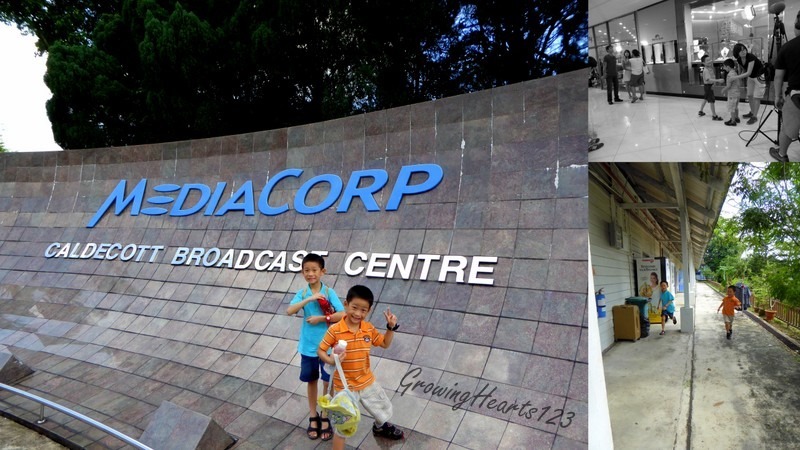 We went with excitement to Mediacorp and waited. And waited. And waited. For a good 1 and a half hours before a bus tooted and sent us to the venue for some action. After the several bumps into Andie Chen takes, they took a break and bumped him again. From this, I realised the opportunity cost of acting is the lost of time in waiting. Actors really need lots of patience! We were glad to have this experience prior to the drama scheduling as it helped me make a more informed decision. The opportunity cost of acting means a lost of precious time waiting and precious holiday time without us. In short, we withdrew from the Chinese Drama filming for J.
I have yet to blog about our Hols Bond time at the church camp, our Ipoh and Malacca road trips, the visit to Gardens by the Bay (again) and preparation for J’s Primary One. That would take some time since there’s loads of photos to collate and collage. 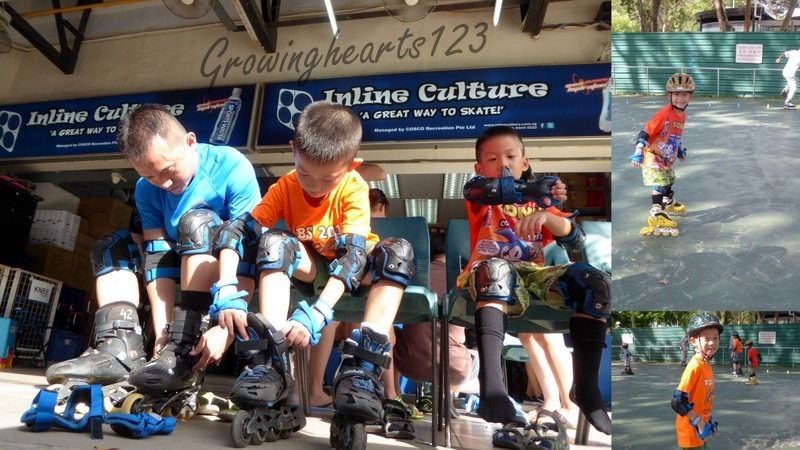 My hubs even signed up for a new sport for the boys- inline skating! The guys bonded significantly in this balancing act and got their dose of warmth from the sunshine and papa’s time! He got the lobang from groupon by the way. For now, I want to capture this new moment before the year moves on, to recap and learn from 2015 while moving forward in liberty growing into 2016. A recap of my 2015’s 15 Things I will do differently. 1) Write more letters and make cards for others. 2) Be more consistent in my exercise routine. 6) Make extra effort to do something out of the ordinary for my hubby. 12) Treasure my current time with kids till future changes. The cancelled items simply means I am satisfied with my effort made and thus ‘fulfilled’ them for last year. It doesn’t mean I will therefore stop doing it. My focus probably will be on the Work In Progress (WIP) items for this year and continue my lifelong resolution of living a healthy and active life e.g no. 2). Another focus would be our service in church. We want to serve others and not be caught up in our own tiny world of family life. This in turn would teach the kids that they are to grow in service to others and not expect us or life to revolve around them. Even if I do not achieve my ‘targets’ or ‘goals’, I am nearer to my goals than before. I regard my resolutions as a stepping stone/ indicator of the direction I am making for myself and my family. When I plan and commit my steps to the Lord, it helps me see the line that I’ve marked in my life journey. This allows for a better perspective of whether my life is in tandem with the ultimate goal we have heavenward in Christ Jesus our Lord. Even as I type the above right now, I realised how precious this blog has been in giving me tangible and fresh insights to who I am, how I’ve spent my time and what flows out from my heart. I keep a private diary and recollecting the journals gives me immense joy and gratitude witnessing the judgement of God at times, as well as the tender mercies and the undeserved grace. A recent conversation I had with a Full Time Working Mum stopped me in my tracks. I had offended my dear friend when I gave my 2 cents worth of how we ‘should’ pay more attention on the young child while we can to instill the good habits before it’s ‘too late’. In a nutshell, it was presumptuous of me to think I ‘know better’. I absolutely don’t. I didn’t know of the financial burdens she had to bear for the families- her own with kids and the extended family. Being a sandwich generation where there’s an older generation to provide for and her own children to support, she needs to work late hours. Unbeknownst to me, she still tirelessly slots in time to guide her todd with story readings and spiritual coverings nightly AFTER her late hours. Her child has no choice but to sleep according to her timings. This lady has a great heart, for God and man. The thing is- the Lord also gifted her a passion like no other in her workplace. Her answer pricked my heart and I realised I had been using my own experiences and encounters to ‘predict’ or judge others. What I had failed to recognise or remember is the Lord’s hand is in EACH of US, His precious child who put our hopes in Him. God is the ultimate One who will determine our paths, teach our children and NOT ME nor YOU who may have put in little effort or for that matter ‘super mum’ efforts. As I pondered upon this truth, I thank God for this revelation that each of us are truly unique and so is our family dynamics. With an insecure background that I had as a child and teenager, I am a living example of the transformation that took place in my later years. Nor can I cause them to Grow like the flowers of the fields. My recent devotion thought seals this lesson and humbly reminds me not to take pride in the works of my hands be it spiritual influence or any other growth. However, this does not mean we can take things easy and not do the hard work of planting, watering and tending the garden entrusted to us. We do it with reverence and care while waiting for the Lord’s timing in its growth. May all Glory Be To God! in short THE MUMS and DADS, take heart, know that our Lord will be the one who will teach them Himself and cause them to grow in His Time and Will. May we be privileged to be a part of that growth, learning from the past and looking forward with confidence knowing our hope is not in the works of our hands per say but in the Person of the Living God. Thank You for journeying with me and the support given by reading GrowingHearts123. Blessings to 2016! Next Dig For, Dig Into, Dig Deep…. Amen and Amen! One of my goals this heart is also to build up faith my my family and be more faithful in attending cell group. May we achieve what our hearts desire and be enabled and empowered by the Lord’s strength. Have a blessed year Angie! Same to you Susan! He will grant the desires and draw you nearer to Him!